Many adults spent up to 1/3 of their day at work. Be Healthy Berrien aims to make all worksites healthier places, with healthy food and physical activity choices for all employees. Healthy employees tend to be happier, more productive, and take fewer sick days. Great Worksite Wellness Programs can be implemented in workplaces of all sizes, and don’t have to be costly or require a health expert to get started. 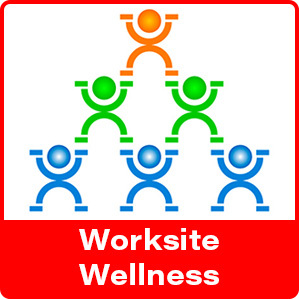 Below, you can find great links to FREE and low-cost resources to create a Worksite Wellness Program that works for your business. The Be Healthy Berrien Worksite Wellness Toolkit is a step-by-step guide to creating a worksite wellness program. It aims to make it easy for worksites of all sizes to create healthy workplaces that include healthy food options, physical activity, and support for healthy choices during the workday. To make health and wellness programming easier, the Michigan Department of Health & Human Services has created Michigan Health Tools, online assessments and websites to help promote and support better health for Michigan citizens. The Designing Healthy Environments at Work (DHEW) tool helps businesses of all sizes create a wellness program to meet the specific needs of their employees. The Healthy Schools Action Tool helps Michigan schools and districts create a culture that supports learning by first measuring the health of school environments, and then planning and implementing improvements based on best practices, including worksite wellness. These tools support the Michigan Health and Wellness 4 X 4 Initiative to create a healthier and stronger Michigan. Point of Decision Prompts are motivational signs placed in or near stairwells or elevators, break rooms, or employee information centers to encourage individuals to make healthy choices and inform people about the health benefits of healthy eating and physical activity. Be Healthy Berrien has created 6 free Point of Decision Prompts an encourages all businesses to print and use these signs.